Want to live in an original White Castle building? 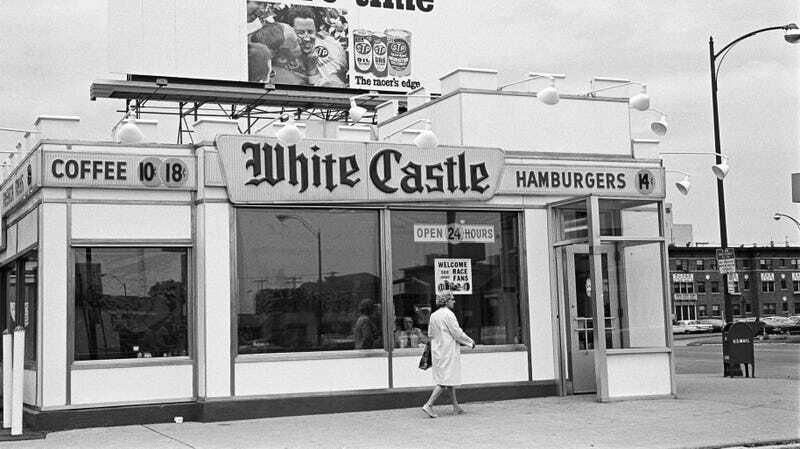 A White Castle in Indianapolis, Indiana photographed in May 1970. The 600-square-foot building at 660 Fort Wayne Avenue in Indianapolis was only the third White Castle ever built, dating to 1927. Vacant for at least a decade, it’s changed hands a few times in the past two years. Indiana Landmarks bought it from the city in 2017 for $1, and then sold it to local resident Jason Hartman at the beginning of this year for $70,000. Now, Hartman is searching for a tenant. Any takers? The Indianapolis Business Journal reports Hartman plans to make some improvements to the white brick, castle-shaped building in hopes of attracting a new lessee. Because of its zoning, the building ironically can’t be used as a restaurant, but could be rented as an office or a live-work space, if you don’t mind living and working in 600 square feet under some turrets. Hartman estimates repairs to the brick facade and interior upgrades will cost about $60,000 and could be finished as soon as July. Given those costs as well as zoning issues, Hartman says his original vision of a purely residential purpose for the building is now unlikely. Still, he’s open to a retail, office, or live-work tenant. White Castle has seen something of a reputation makeover of late, as it went from stoner punch-line to quasi-ironic Valentine’s Day dinner destination to legit fast-food option for vegans. If the Indianapolis property appeals to you, it’s reportedly listed through FS Houses.